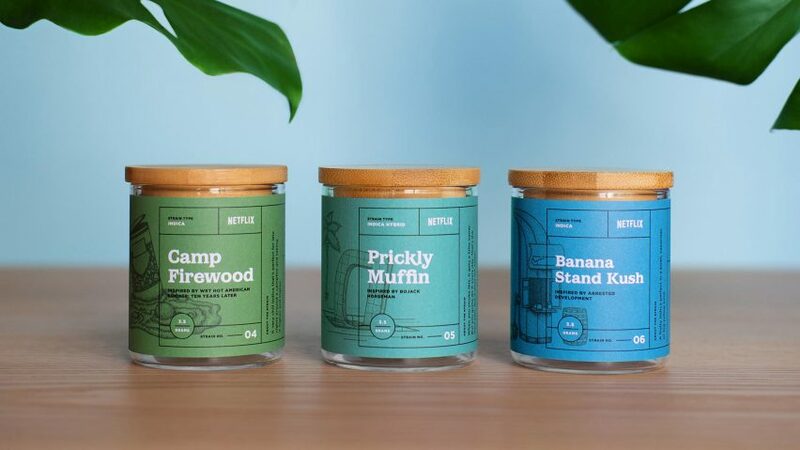 Streaming giant Netflix has partnered with creative agency Carrot and a California cannabis dispensary, to produce weed themed around several of its TV series. The stunt lit up social media over the weekend, as the marijuana in limited-edition packaging went on sale in a pop-up shop in West Hollywood. The stunt was aimed at promoting Netflix's new show Disjointed, which is set in a cannabis dispensary. Arrested Development, Bojack Horseman and Orange Is the New Black were among the 10 titles to be given their own dedicated strain of marijuana – complete with punny name and packaging in one of the spectrum of rainbow colours. To pull off the project, Netflix partnered with Carrot – a digital agency that is part of the Vice network – as well as the Alternative Herbal Health Services (AHHS), a medical cannabis dispensary. Carrot executive creative director Jonathan Santoro told Adweek that, for legal reasons, it was important that neither his studio nor Netflix ever "physically touched the flower". They didn't technically sell it, either. Instead, Carrot acted more like curators, providing the AHHS with "descriptions of feelings for certain shows" and working with them to pair the series with their appropriate marijuana strains. AHHS handled the weed, put it in packaging of Carrot's design, and sold it. Netflix's lawyers were also heavily involved, and worked with the state of California and the city of West Hollywood to make sure the company – which reported $8.83 billion (£6.8 billion) in revenue in 2016 – was acting within the law. The weed was sold through AHHS' West Hollywood dispensary, which was given a temporary redesign by Carrot over the weekend to make it look similar to the store featured on Disjointed. Carrot's artisanal-looking packaging design for the product sees the marijuana sold in wood-lidded jars. Each strain is represented by one of nine shades from across the colour spectrum, ranging from red for Baka Bile – inspired by the zombie comedy Santa Clarita Diet – to green for Wet Hot American Summer's Camp Firewood and violet for Lady Dynamite's Sassafrass OG. Other notable titles in the range include Poussey Riot (Orange Is the New Black), Peyotea 73 (Grace and Frankie) and Banana Stand Kush (Arrested Development). There are also three strains dedicated specifically to Disjointed, all packaged in black with metallic lettering. All the labels also feature illustrations inspired by their corresponding TV shows, as well as information panels. Asked by Adweek how they could be sure the marijuana strains were appropriately matched to their respective TV shows, Santoro said: "I don't know if I can legally answer that question, but it is fair to say that Carrot did the research necessary." Cannabis is currently one of the fastest growing industries in the US, with California-based research firm Arc View predicting the retail and wholesale marijuana market could reach nearly $11 billion (£7.6 billion) in annual revenue by 2019. The sale and possession of marijuana is legal for both medical and recreational use in California, along with seven other US states. Another 23 have legalised its use in some form. Along with the decriminalisation of marijuana has come a range of new designs for users, including a line of edible cannabis products by Pentagram and US rapper Snoop Dogg and a minimal glass pipe by Jamie Wolfond for smoking accessory brand Tetra.